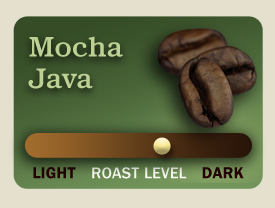 Mocha Java is considered the first blend ever created in the world. Since then many variations have emerged on this rich, high strength, earthy, full bodied coffee. Yes, you might notice a hint of a chocolate finish. It is very aromatic and the flavor is unique.